Heat oven to 350°F. Spray 9x5-inch loaf pan with cooking spray. In small bowl, mix granulated sugar and 1 teaspoon of the pumpkin pie spice. Separate dough into 8 biscuits. Separate each biscuit into 2 layers, making total of 16 biscuit rounds. 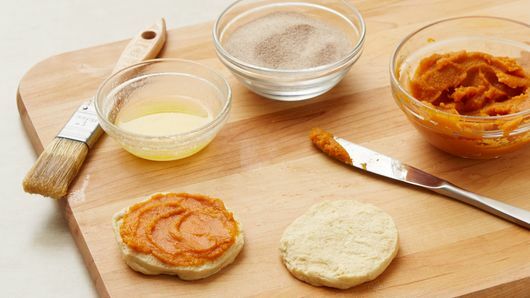 Brush one side of each biscuit round with melted butter. Spread slightly less than 1 tablespoon pumpkin pie mix on top of each. Sprinkle rounds with spice-sugar mixture. Stack biscuits in 4 piles of 4 biscuits each. 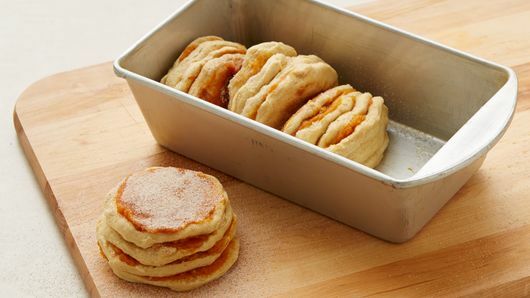 Place stacks on their sides in a row in loaf pan, making sure sides without filling are on both ends touching pan. Bake 40 to 45 minutes or until loaf is deep golden brown and center is baked through. Cool 10 minutes. Turn pan upside down on serving platter. In small bowl, mix powdered sugar, milk, vanilla and remaining 1/4 teaspoon pumpkin pie spice until thin enough to drizzle. Drizzle over warm loaf. Serve warm. Pumpkin pie mix used in this recipe is not the same as canned pumpkin. Pumpkin pie mix contains a blend of traditional spices as well as sugar. Regular canned pumpkin does not contain salt, sugar or spices. Assemble the loaf as directed in recipe up to a day in advance. Cover with plastic wrap, and store in refrigerator until ready to bake. Bake as directed in recipe. 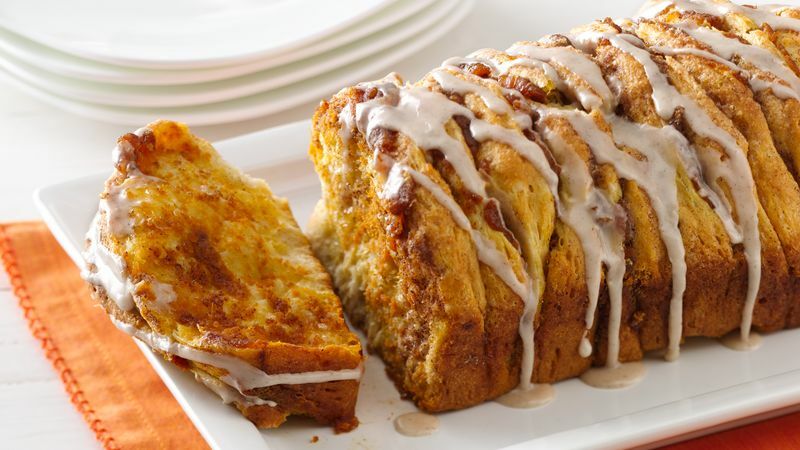 Serve this loaf with a side of pumpkin butter for even more fall flavor.